Expectations can be a bear. 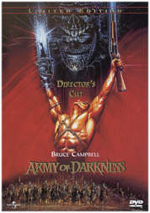 When I got a copy of 1993's Army Of Darkness last month, I had some idea what kind of film it would be but I wasn't prepared for how much I'd enjoy it. The movie offered a wild and witty romp that entertained me thoroughly at all times. 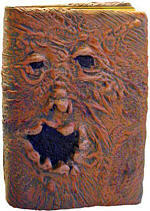 As such, I greatly looked forward to getting Army's predecessor, 1987's Evil Dead II. Although I knew it had a different setting, I figured this movie would follow along similar lines and would provide more insane thrills with reluctant and cowardly hero Ash (Bruce Campbell) as he fought mysterious undead forces. Unfortunately, Dead II couldn't live up to my expectations. As a result, I found a movie that seemed moderately compelling but ultimately disappointing. One problem I encountered is mine alone: confusion about where the original 1982 Evil Dead stopped and the sequel started. The beginning of Army provided a neat and tidy recap of the prior film, and I rarely felt like I was "missing" anything because I hadn't already seen the first two pictures. Perhaps because Dead II seems to assume that you've already seen the first movie - weak recap aside - I found the characters to be weak and ill-defined. I already had a good notion of who Ash was from Army, but the Ash of Dead II appears much more vague and not nearly as interesting. In Army, we saw the neat dichotomy of his personality, as he was a wimp and a coward in all aspects of life other than when he had to battle the "Deadites"; then he became a vicious fighting force. This seems less clear in Dead II; yeah, he takes down some zombies nicely, but the character still was tentative and half-drawn. While the Ash of Army is a cartoon, he's a fun cartoon, whereas Dead II's Ash is just bland and flat. Whereas Army was largely an outrageous comic book, Dead II functions more as an over-the-top horror film. I don't think this tone affected my enjoyment of it, since I knew in advance it would differ from Army in that regard, but I think it felt less-than-successful to me anyway. It all goes back to the weak characters; Ash and the others just aren't very interesting, and I had a hard time getting involved in the story because of that. Add to this a less-coherent story than the one found in Army and you have another reason for my disenchantment with it. Most of the time Dead II just feels like various acts of monster violence with little purpose. Granted, life works that way sometime; if you're being attacked by undead forces, you may not actually have any kind of general theme to surround those events. Nonetheless, it made the results less stimulating to me, as the movie seemed to go nowhere at times; it's just a lot of running around and killing without much purpose or direction. Dead II has some solid moments of wackiness and silliness, but I didn't think they approached the greatness of Army. Half of my enjoyment of that film came from its nutty skeletons at the end, but Dead II has no characters to rival those boney goofs. I didn't dislike Evil Dead II, as director Sam Raimi created a generally entertaining and wild atmosphere which stretched the boundaries of horror movies. However, I can't hide my disappointment at it, since I don't think it remotely compares with the pleasures of its follow-up, Army Of Darkness. Feel free to disagree with me - a scan of other opinions shows very different reactions to the two films - but I find Army to offer a much more entertaining experience, so if you want to watch Dead II, do so before you see the third part of the story. 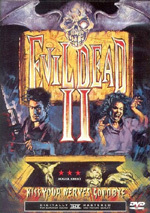 Evil Dead II appears in both an aspect ratio of approximately 1.85:1 and in a fullscreen version on this single-sided, double-layered DVD; the widescreen image has been enhanced for 16X9 televisions. Only the letterboxed picture was reviewed for this article. This transfer fell into the “silk purse/sow’s ear” category, as it represented the source material with reasonable fidelity but could only do so much with such messy footage. Colors were subdued and somewhat pale but they seemed largely accurate, and I noticed no problems related to them such as bleeding or noise. Black levels looked a bit mushy to me and they lacked boldness or depth; there's a mildly tentative quality to the dark scenes. Shadow detail often appeared a little heavy. I didn't have a terrible time making out the action in low-light shots, but since these kinds of scenes dominated the film, I had more trouble than I would have liked. Ultimately I found Dead II to present a perfectly watchable image but nothing better than that. Again, I blamed the original footage, as I thought the replicated that material with decent fidelity. More substantial problems came with the Dolby Digital 5.1 soundtrack of Evil Dead II. Actually, some parts of it seemed positive, such as the breadth of the soundfield. The action spread nicely to the side channels, with a great deal of effects and music emanating from the front right and left speakers. This usage added a nice component of involvement to the mix, especially when we consider the extra kick boasted by the rears; the surround speakers presented solid ambiance and occasionally tossed out some good split-surround effects as well. The track lacked the smooth integration of true 5.1 mixes, but it worked nicely from a soundfield point of view. Unfortunately, the quality of the audio was simply terrible. Dialogue came across as thin and lifeless at best, and it became very harsh and edgy at times. I understood most of the speech, but some lines were unintelligible due to the shrill and sibilant nature of the audio. Effects seemed flat and dull and displayed some distortion as well. The music appeared thin and excessively-bright, but it was largely free of the harshness that harmed the other aspects of the mix. The track included some boomy bass that tended to overwhelm the action in an artificial manner. I got the impression the sound designers cranked up the low-end to distract us from the flatness of the other elements. Despite the fairly ambitious soundfield, I simply couldn't give this mix a higher rating than a "D+" due to the very weak quality of the audio. Even a film with a fairly low budget shouldn't sound this bad. I'd be disappointed with the sound if it accompanied a movie from 1947, so for a 1987 effort to appear this poor was problematic. This edition of Evil Dead II incorporates a mix of supplemental features. First up is an audio commentary which comes from a 1998 laserdisc release of Dead II. It features actor Bruce Campbell, director Sam Raimi, co-writer Scott Spiegel, and special make-up effects artist Greg Nicotero, all of whom were recorded together for a running, screen-specific chat. All four men provide roughly equal amounts of information. The commentary covers a mix of production issues. We hear a lot about low-budget filmmaking. The guys provide notes about makeup and effects, continuity problems, locations and sets, characters and the actors, and many bits of trivia. Next up is The Making of Evil Dead II, or The Gore the Merrier, a 31-minute and 50-second featurette about Dead II. It mainly discusses the technical details, and it does so in a terrifically compelling manner. The program features contemporary interviews with make-up effects artists Robert Kurtzman, Howard Berger, and Greg Nicotero; they essentially act as the piece's narrators. While we find some "talking head" shots of those gentlemen, the vast majority of the visual action comes from a slew of wonderful video footage taken from the set. We get a lot of great information from these images, and they single-handedly make this a fantastic documentary. In addition, the DVD includes a preview for a videogame based on the series. Called Evil Dead - Hail to the King, this piece lasts one minute and 20 seconds and provides a pretty uncompelling look at the game. The Still Galleries section provides two sub-areas. There's "Horror Highlights" which offers 56 shots from the film, and "Behind the Screams" which includes 31 pictures the detail the production of the movie. Much of the same material was covered in the documentary, but at least this area shows the shots in greater detail. Dead II includes the THX Optimode program to set up your TV. This provides you with information to correctly configure various audio and video aspects of your home theater. I don't think it fully replaces something like Video Essentials, but then again, "Optimode" comes as a free addition to a DVD, so it's clearly a bargain. If you haven't already used Essentials or some similar product, you should find "Optimode" very helpful. Finally, we get the original theatrical trailer for Dead II plus Talent Bios for Campbell and Raimi. These are actually pretty solid little entries that provide more depth than usual for these listings. Although I found Evil Dead II to be a disappointment, bear in mind that I had exceptionally high expectations for the film, so my reaction to the movie may change when I watch it again. In any case, Dead II offers an over-the-top horror flick that didn't light my fire but made for a generally fun piece. The DVD features fairly weak picture and harsh sound but offers some solid extras. Although I was disappointed by the quality of the presentation, I have the feeling a lot of the concerns resulted from the original material. As such, Evil Dead fans will probably be satisfied with this disc.